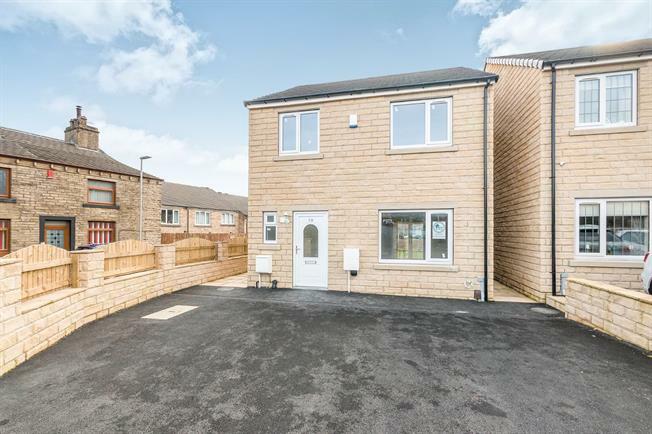 4 Bedroom Detached House For Sale in Halifax for Offers Over £200,000. A magnificent new build property that has been constructed to the highest possible specifications on a select small development and which offer well planned living accommodation, briefly comprising a hall, a large lounge, spacious modern fitted kitchen diner with a full range of integrated appliances and patio doors leading outside, 3 double bedrooms and 1 single bedroom, a stylish 4 piece family bathroom and WC. Externally the property boasts a good size south facing enclosed lawned rear garden, together with the added benefit of off street driveway parking for mulitple vehicles. This superb property would make a perfect family home and an internal inspection is absolutely essential to fully appreciate the size and quality of what is on offer for sale. Double glazed uPVC window with obscure glass facing the front. Radiator, vinyl flooring, tiled splashbacks, painted plaster ceiling and ceiling light. Loft access. Double glazed uPVC window with obscure glass facing the side. Carpeted flooring, built-in storage cupboard, painted plaster ceiling and ceiling light. Single bedroom with double glazed uPVC window facing the front. Radiator, carpeted flooring, painted plaster ceiling and ceiling light. Double glazed uPVC window with obscure glass facing the side. Heated towel rail, vinyl flooring, part tiled walls, painted plaster ceiling and downlights. Low level WC, panelled bath with mixer tap, single enclosure shower, top-mounted sink and extractor fan.